In Defense of Joseph: Did Joseph lie about polygamy? As I said in the previous post, I believe Joseph wasn’t a liar and deceiver. He endured great hardships for his beliefs. A liar and deceiver wouldn’t have done so, but would have quickly moved on to “greener” and more lucrative pastures. In addition, the events of his life certainly showed he didn’t use those who believed him to further his power, fame, or fortune. And thus, since He wasn’t a liar and a deceiver, then he was who he said he was: a prophet of God. The Utah LDS also believe he was a prophet of God and that he was responsible for the introduction of the celestial marriage doctrine (also called spiritual wifery or polygamy) into their church. They believe God revealed to him this doctrine giving him a revelation in 1843 on this subject, which is now section 132 of the Utah LDS Doctrine and Covenants. However, Joseph never publically taught this doctrine, but in fact, stood against it. (Joseph always denied association with this doctrine. See Joseph Smith Fought Polygamy). According to the Utah LDS, since he brought forth the revelation, but openly denied his association with it, he must have secretly taught and practiced this doctrine. Thus, they believe he openly lied about not being a polygamist. While I respect their position, I don’t understand it. Once a person has lied to me or purposely deceived me, I have great difficulty trusting them in the future. In future associations with them, I’m skeptical as to whether they are being truthful and honest with me. It’s only after their future actions continue to show me they are trustworthy that I can trust them again. If I believe Joseph lied about not teaching and practicing polygamy, how can I believe he didn’t lie about the Book of Mormon, or his revelations, or the Inspired Version of the Bible? I can’t, regardless of the reasons for his lie. As I search the Internet what amazes me is that all the sites discussing Joseph’s alleged practice of polygamy and his deceitful cover-up never consider the possibility that he may have been telling the truth. It is assumed he taught and practiced polygamy and just lied about it. It appears to me that this narrow reasoning comes from the teachings of the Utah LDS Church over the years and from the many historians who have bought into this position. Nevertheless, I do believe Joseph Smith, Jr. did not teach or practice polygamy. He was a prophet of God and he didn’t lie to his people. I think you should have a look at your Church History in the Fulness of Times Student Manual used by Institute Students. "Moreover, Joseph Smith and the Chuch were to accept the principle of plural marriage as part of the restoration of all things (see v. 45). Accoustomed to conventional marriage patterns, the Prophet at first understandably reluctant to engage in the new practice. Due to the lack of historical documentation, we do not know what his early attempts were to comply wiht the commandment in Ohio. His first recorded plural marriage in Nauvoo was to Louisa Beaman; it was performed by Bishop Joseph B. Noble on 5 April 1841. During the next three years Joseph took additional plural wives in accordance with the Lord's command. Steven, thank you for taking the time to comment. From what you said it appears you are presuming I am Mormon. However, I am not, nor ever have been, a member of the Utah LDS Church. I am a member of the Restoration Branches Movement of the Reorganized Church of Jesus Christ of Latter Day Saints (RLDS). This movement believes in the original doctrines of the RLDS Church, which was established in 1860. The Utah LDS Church finds itself trying to stand on a very slipper slope today with regards to polygamy. 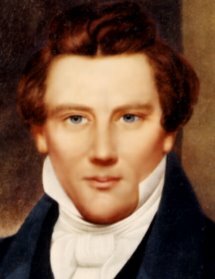 If they continue with the position of Brigham Young, that Joseph was the author of polygamy in their church, they have to accept that Joseph lied about it because Joseph always taught against it and stated he didn’t practice it. The problem comes then that if Joseph lied about his involvement with polygamy, couldn’t he have also lied about his experience in the grove, the Book of Mormon, the revelations in the Doctrine and Covenants, and the Inspired Version? He certainly could have which would make their entire foundation questionable. On the other hand, if the LDS Church acknowledges that Joseph told the truth, then they have to acknowledge that Brigham Young didn’t. And their beliefs in the Adam-God theory, blood atonement, celestial marriage, and temple ordinances would be based on Brigham Young’s lies, and thus incorrect. From what you quoted, the Utah LDS Church seems to be taking the position that Joseph was a polygamist but in a minimizing way. It appears to me they are trying to do some damage control. But the odd thing to me is that they were the ones that originally taught that he was a polygamist, and thus they are coming full circle. When one looks at all the books that have been published proclaiming Joseph to be a polygamist, it is difficult to understand how anyone can believe he wasn’t. However, it is not the volume of information that is important -- only its integrity and truthfulness. And that is where these books fail. In June, 2009, Joseph will have been dead for 165 years. There is no new information being found (except for DNA that is mostly ignored by these books) to write about. All these books just re-interpret old information to draw conclusions the author wants to draw. And when one objectively looks at the old information and evaluates it according to standards used in courts of law (i.e., how close to the event it was recorded, if it was first hand knowledge, if there was a motive to lie or slant the truth, etc. ), he finds that the old information doesn’t stand up to such scrutiny. Thus, there is no real proof Joseph taught or practiced polygamy. So, if Joseph was “lied about” to justify polygamy, why do the books written today continue that lie. Some are written by authors with Mormon backgrounds who have been so schooled in the idea that Joseph taught and practiced polygamy and lied about it that they can’t get past that notion. However, this doesn’t really explain why many ignore or dismiss evidence like the Temple Lot Case or present DNA evidence showing that about half of his alleged children from polygamist marriages have been proven not be his biological children. I believe that the majority of these authors have hidden agendas to demean the character of Joseph and thus negate the work of God through him. To me, this is most evident in the recent book, Nauvoo Polygamy “… but we called it celestial marriage” by George D. Smith, publisher of Signature Books. While this topic is enough to fill several blogs, let me summarize it by saying that most of the books now being written about Joseph and polygamy are coming from authors associated with three groups: John Whitmer Historical Association (JWHA), Sunstone, and Mormon History Association (MHA). It is interesting to note that Signature Books publishes Sunstone Magazine and some books of authors associated with JWHA and MHA. The JWHA was established by and continues to have membership of those who led the RLDS Church (now Community of Christ) into mainstream Christianity. Their attack on Joseph continues in order to rid that church of its Restoration Movement origins and doctrine. Because of many JWHA members are involved with Sunstone and MHA, I’m speculating that an underlying motive of many involved with Sunstone and MHA is to influence the leadership of the Utah LDS Church to do the same. Thus, I believe the lie continues to be promoted and magnified by those whose agenda is not to tell the truth but to move the Restoration Movement into mainstream Christianity. I hope this clarifies a little more of my position. What happened to the original RLDS leadership? Why did they go into the community of Christ church? In the late 1950s the leadership of the RLDS Church began to change Church doctrines and ordinances to correspond with those of Protestant Christianity. Around 1985, the leadership began to close some of the congregations and silence some of the ministers who disagreed with these changes. In order to preserve the original beliefs of the RLDS Church, those who disagreed with the changes and actions of the Church leadership, formed branches of their own and called them Restoration Branches. Restoration Branches maintain the original beliefs of the Reorganized Church of Jesus Christ of Latter Day Saints. In 2000, the members of the RLDS Church who embraced the doctrinal changes of the Church leadership, changed the name of the Church from the Reorganized Church of Jesus Christ of Latter Day Saints to the Community of Christ. When the split occurred and Restoration branches were formed, the priesthood continued in the same authority as they had in the RLDS Church. The liberal RLDS leadership did silence many of the priesthood who left. However, these silences were not recognized by the Restoration branches because there was no moral or doctrinal reasons for their priesthood licenses to be removed—only that they were no longer supporting the leadership who were teaching false doctrines and leading the Church into apostasy. like steven says, you need to look into more than your narrow field of study. go to www.wivesofjosephsmith.org and you can see all the women he was involved with. its no secret Joseph was involved in plural marriage, even though he was publicly denying it. p.s mormons are a lot more than just utah these days. get with the times. Anonymous, thank you for your comments. I have read the information at www.wivesofjosephsmith.org which at first seems conclusive that Joseph was a polygamist. However, upon deeper investigation, the “evidence” upon which this site is based is merely allegations, not proof. People can allege anything about anyone. (And if they are dead, like Joseph, they can’t refute those allegations.) However, for allegations to be true, they must be proved. And the ultimate test of the truth of an allegation is whether it can be proven to be true in a court of law through cross-examination and other corroborating evidence. In the Temple Lot Case in the 1890s, the U.S. Circuit Court Judge, John F. Philips, heard testimony from the Utah LDS Church’s best witnesses that Joseph Smith, Jr. was a polygamist and introduced polygamy into the church. He also listened to their responses through cross-examination as well as testimony and cross-examination of witnesses provided by the Church of Christ, Temple Lot, and the RLDS Church on this subject. It was his conclusion that the allegations set forth by the Utah LDS Church were not true. Thus, in the best setting that this country has to determine truth, Joseph Smith, Jr. was found to be innocent of teaching and practicing polygamy. The decision of this court case is the only proof that exists about the issue of Joseph and polygamy. All the rest are unproven allegations. To the credit of the www.wivesofjosephsmith.org site, they reference that five of the twelve children (almost half) that are alleged to be Joseph’s children from polygamist wives have been determined by DNA to not be his children. Since the object of polygamy in the early LDS Church was to produce children, this DNA evidence is proving Joseph was not a polygamist. Thus, when Joseph says he didn’t teach or practice polygamy, I believe him because that is where the proof, not allegations, points.